Seafood is a wonderful decision anytime. Even better are these utterly delicious keto bacon wrapped scallops drizzled with garlic butter! WHAT ARE BACON WRAPPED SCALLOPS? Bacon wrapped scallops are exactly what they sound like. They are scallops wrapped in bacon and cooked in some form. They can be baked, cooked stovetop, or fried. Scallops can be used in any number of seafood dishes and always prove to be utterly delicious. Add butter (like we do here) and some garlic (like we do here) and you’ve got all the makings of a mouthwatering meal. ARE BACON WRAPPED SCALLOPS GLUTEN-FREE? Yes! Due to the fact that this recipe only calls for a few ingredients (all of which are gluten-free) this dish is 100% gluten-free! 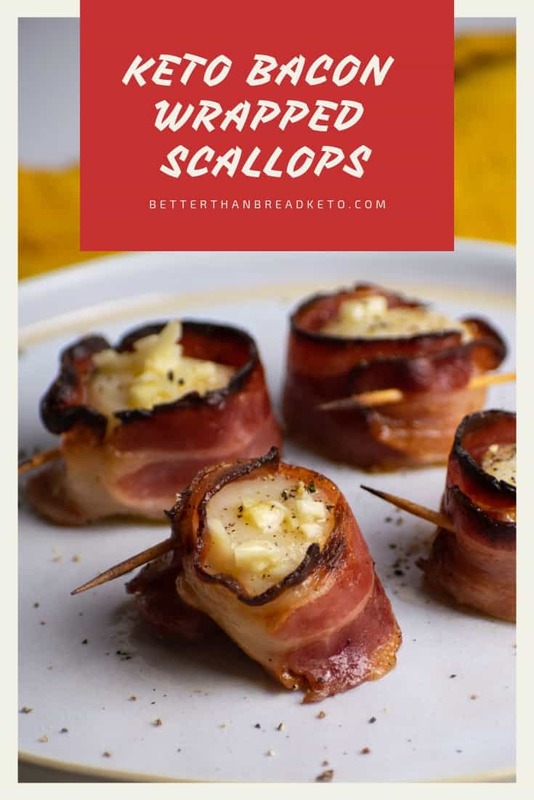 ARE BACON WRAPPED SCALLOPS KETO? 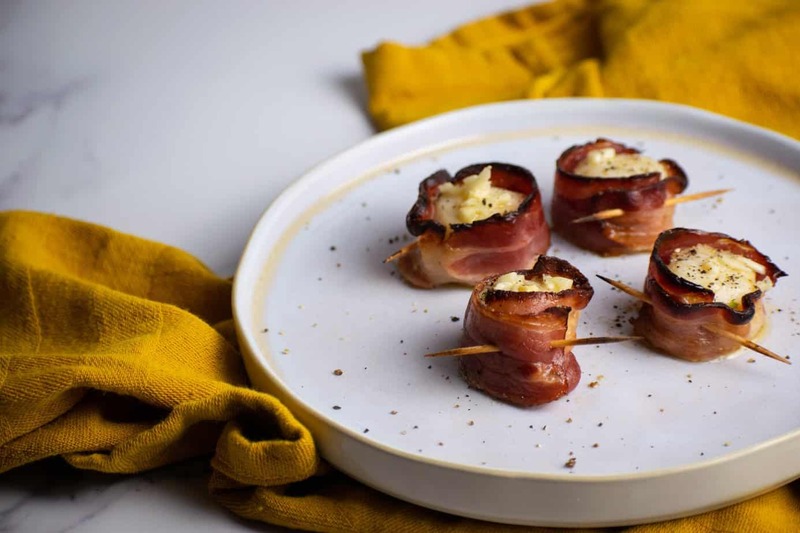 Depending on the recipe, bacon wrapped scallops might not be keto. Some are battered and fried, while others are only low-carb, not adding the extra fat-laden butter component. However, this recipe is keto thanks to the fat-filled bacon and the (basically) pure fat butter poured overtop. After you have everything on this list, you’re set and ready to go! Begin by preheating your oven to 425˚F. Using a paper towel, pat the scallops dry and wrap with bacon slice halves. Secure the bacon to the scallop by inserting a tooth pick through the bacon and scallop longways. Place onto a baking sheet with a silicone liner. Salt and pepper each scallop, and place into the oven. Cook for 10 – 15 minutes until the scallop is opaque and the bacon begins to crisp slightly. Mix the melted butter and minced garlic. Remove the scallops from the oven and drizzle garlic butter overtop. Eat and enjoy! Instead of using your oven, it is possible to make these delicious scallops in an air fryer. Quite simply, you will follow all of the same directions for this recipe, except using your air fryer. If you’re someone who much prefers to use your air fryer instead of a traditional oven, this is a perfect solution for you! CAN YOU FREEZE BACON WRAPPED SCALLOPS? Unfortunately, no. Freezing scallops is not going to work. Using frozen scallops for this recipe is fine, since they aren’t cooked yet. However, freezing, thawing, and reheating bacon wrapped scallops would end up creating a not very tasty end product. They simply won’t turn out well. There are plenty of delicious recipes that go great with bacon wrapped scallops. If you use them as a main course, you might be looking for a side dish recipe. Similarly, if you use them as an appetizer or side dish, you might be looking for a good main course recipe. Whichever the case, here are a few yummy ideas to get you started! For more ideas, you can check out our recipe index. Click on the links to see the items used in making this recipe. You can also find these products linked in the recipe below. Silicone Baking Liner – A silicone baking liner can really make your kitchen cleanup life so much easier. The liner is placed onto a baking sheet (there are different sizes of liners to fit different sheets) and keeps anything and everything from sticking to the pan. The even better news? The liners help the food cook more evenly and are super easy to clean after you finish cooking!